My big guilty pleasure these days is coloring….. I color about an hour a day and I have coloring books and felt tip markers in both the living room and my office. It’s a pleasure pig move because it rebuilds oxytocin, not to mention how relaxing, creative, fun and satisfying it is. I am hooked! While on a book tour at Transitions Bookstore in Chicago twenty years ago for Hot Chocolate for the Mystical Soul, I met the owner, Gayle Mandel, who shared with me her true story of manifesting her soulmate by coloring a love mandala. Gayle was ready to manifest her soulmate and as she used different colors in each section of the mandala, she spoke out loud the trait or quality she most desired in her soulmate. Less than three weeks later, while at the gym looking her worst, she met the man on the exercise machine next to her, Howard. He has now been her loving, devoted husband for 30 years! This all happened long before I had any thoughts of writing The Soulmate Secret (in which I share Gayle’s story), but having learned it, I instantly began to color mandalas to successfully manifest all kinds of things in my life! 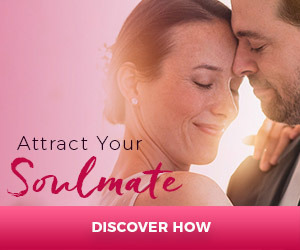 After a painful divorce from a 27-year marriage, and dating for another almost 6 years without finding the soulmate I was seeking, I came across The Soulmate Secret. I followed your steps to attract my soulmate and found that the most enjoyable and profound step for me was to color a love mandala. I used a spiritual color guide where each color correlated to a spiritual quality (ie: Blue represents wisdom and clarity). Then I used the all the colors that correlated with the qualities I was seeking in my soulmate to fill in the sections of the mandala (red for loving and passionate, orange for vitality, brown for groundedness, grey for balanced, yellow for spiritual connection to God, and so forth). Three months later I met Jim and eighteen months later we married in a beautiful ceremony. We have now been together for 9 years, and we look forward to sharing the rest of our lives together, loving, growing, having fun and working to make the world a better place. 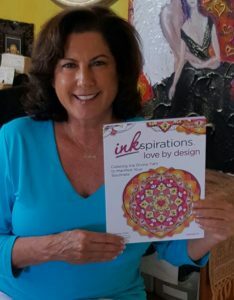 For those of you who are open to coloring as a manifestation tool, I am excited to announce the publication of my new coloring book, Inkspirations Love by Design: Coloring the Divine Path to Manifest Your Soulmate. This unique, transformational coloring book offers simple yet specific exercises, completed in concert with 32 specially designed coloring pages by internationally acclaimed artist Manja Burton. Coloring in this book creates the frequency of love in your life that allows you to engage your romantic destiny. Love by Design comes out February 7th and you can pre-order now at: http://amzn.to/2hQJ0ZO. P.S. Come meet me in person, I will be on Book Tour in February to San Diego, LA, San Francisco, Miami and Boca Raton, Florida. Details here.